This blissfully responsive, luxuriously breathable euro top mattress is constructed with natural, renewable materials. Bamboo is woven into the mattress quilting and incorporated in the top layer of Visco memory foam, maximizing airflow and breathability so you stay at a comfortable sleep temperature all night long. A unique Aloe Vera treatment enhances the soothing softness of the attractive wave-stitch mattress cover. If you seek an innovative, healthy, and environmentally friendly sleep surface, this is the mattress for you. 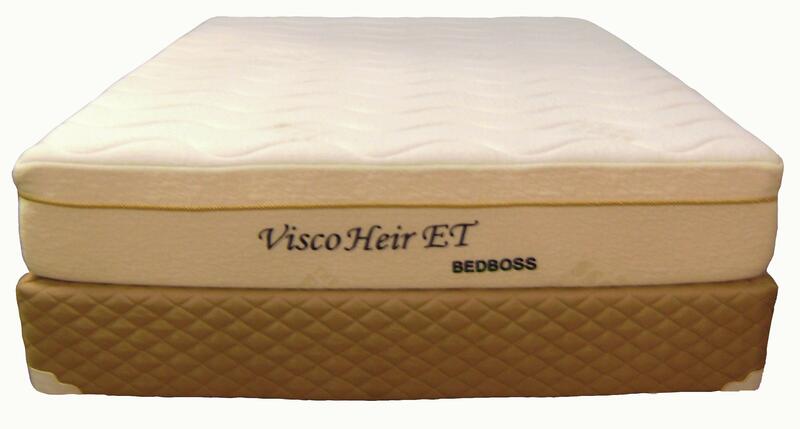 The Visco Heir Full Euro Top Memory Foam Mattress and Foundation by Bed Boss from Nashco Furniture - Nashville. We proudly serve the Nashville, Franklin, Brentwood, Clarksville, Green Hills, Davidson County, Williamson County, Tennessee area. Product availability may vary. Contact us for the most current availability on this product. Top Soft Blended Bamboo Cover with Aloe Vera Treatment and Wave Stitch, Quilted with 1" Cooling Bamboo-Infused Memory Foam. The Visco Heir collection is a great option if you are looking for Mattresses in the Nashville, Franklin, Brentwood, Clarksville, Green Hills, Davidson County, Williamson County, Tennessee area.